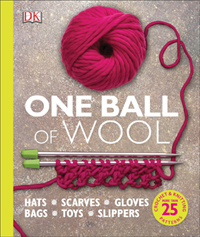 Using just one ball of wool, cotton, silk or variegated yarn, you can make any of the huge variety of knitting and crochet projects in this book. All of the projects are on trend, with easy patterns ranging from hats, scarves, headbands and mittens, to bags, toys and home accessories such as baskets and throws. Using just one ball of wool means many projects can be completed in just a few hours following the straightforward instructions and handy technique sections.